The Richardson Studio was founded in the 20s by John Richardson and produced the artwork for primarily Paramount posters through to the early 60s. Their posters are probably the finest examples of the intricate hand litho process with their unique style and striking graphic art and they are now very hard to find. This exhibition is probably the largest single display of Richardson Studio posters ever seen in one place. I have included some examples from my own collection and some images also appear with thanks to Bruce Hershenson, Grey Smith, Glenn Taranto, from his Richard Dix collection, Craig Kennett, Ben Wadley, and other private collectors. These posters are not for sale although I do have a small selection available on this website and in my eBay Store. There are a number of avid collectors of Richardson Studio posters including Brian Arnold who is also putting together an exhibition that will no doubt feature a number of additional posters not seen on this website. It is simply impossible to include examples of every Richardson Studio poster but my aim is to show collectors a selection of the wonderful artwork of these posters. I hope you enjoy the exhibition. Directed by George Stevens. Starring Montgomery Clift, Elizabeth Taylor, Shelley Winters. Directed by Daniel Mann. Starring Robert Ryan, Harry Morgan, Shirley Booth. Directed by Sam Newfield. 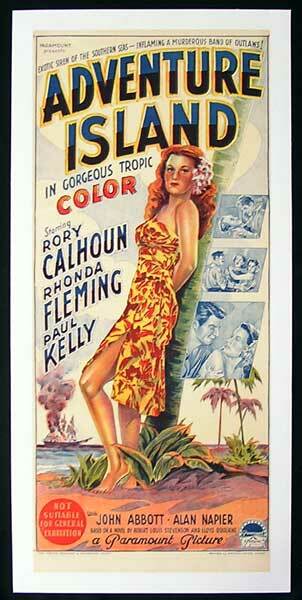 Starring Rory Calhoun, Rhonda Fleming, Paul Kelly. Directed by William A. Seiter. Starring Joan Fontaine, Walter Abel, Byron Barr. Directed by John Farrow. Starring Ray Milland, Darryl Hickman, Audrey Totter. Directed by Stuart Heisler. Starring Susan Hayward, Frances Farmer, Dorothy Sebastian. Directed by George Marshall. Starring Dorothy Lamour, Fred MacMurray, Betty Hutton. Directed by George Seaton. With José Ferrer, Kim Hunter, Kurt Kasznar, Eugenie Leontovich. Directed by Lewis Milestone. Starring Bing Crosby, Ethel Merman, Ida Lupino. Directed by Charles Marquis Warren. Starring Charlton Heston, Jack Palance, Brian Keith. Directed by Frank Tashlin. Starring Dean Martin, Jerry Lewis, Shirley MacLaine. Directed by Jerry Hopper. Starring Gene Barry, Anthony Warde, Lydia Clarke. Directed by Edward H. Griffith. Starring Sterling Hayden, Dorothy Dandridge, Madeleine Carroll. Directed by Melville Shavelson. Starring Bob Hope, Vera Miles, Paul Douglas. Directed by Jerry Lewis. Starring Jerry Lewis, Alex Gerry, Bob Clayton. Directed by John Farrow. Starring Alan Ladd, Donna Reed, Conrad Janis.